Horizontal propane tanks range in size from the very small 5 gallon horizontal BBQ tank variety… to the very large million gallon silo mega-tanks. Shown here is a 1000 gallon horizontal propane tank used for commercial purposes. 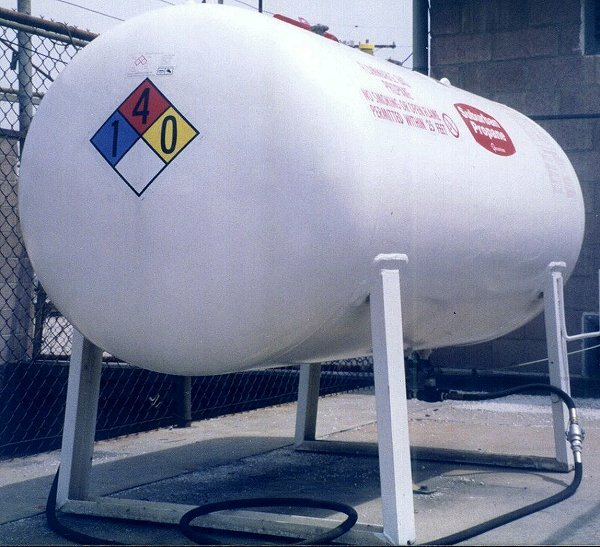 Many horizontal propane tanks are used to heat residential dwellings and at refilling service stations. Listed below is a list of 3 of the top North American tank manufacturers. If you are interested in purchasing a horizontal propane tank, use the contact information below to gather quotes and compare pricing. We rank these horizontal tank manufacturers in order of their national ranking and customer satisfaction. #1. American Welding and Tank – (AWT) is the established North American leader of propane tank manufacturing and design since 1917. AWT’s tanks are found in residential, commercial, industrial and agriculture applications. As new housing developments and businesses locate beyond the scope of existing energy supply chains, AWT is ideally positioned to capitalize on the growing trend for propane and alternate energy applications. Additionally, AWT tanks provide extended shelf-life reserves in power generation applications. American Welding and Tank also provides a propane tank repair services for both A.S.M.E. propane tanks and D.O.T. propane cylinders. AWT’s repair and recycle services uniquely define the company as the only ASME propane tank manufacturer and refurbisher of both ASME and D.O.T. cylinders worldwide. #2. Hanson Tank – (Roy E. Hanson Jr. Mfg.) is a major U.S. manufacturer of carbon and stainless steel pressure vessels built to the ASME Boiler and Pressure Vessel Code, Sect VIII, Div I and HLW. Founded in 1932 the company manufactures and ships over 15,000 pressure vessels, with a value of over ten million dollars, annually to destinations all over the world. 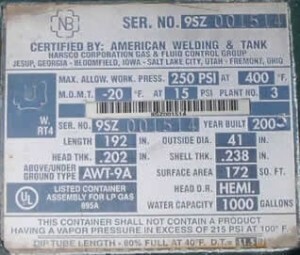 In addition to the nameplate being legible and permanently attached to the tank, the following must be displayed on the manufacturers nameplate for the horizontal propane tank to be serviceable in the United States. This information is also useful when contacting Powerblanket or any other GCW – Tank Warming Manufacturer. For those living in cold climates, gas mileage can be dramatically increased by preheating propane to optimal temperatures. See our cylinder warming guidelines for proper fit and placement of external blankets and heat cylinder wraps.